FormatWorks simplifies the import process to SolidWorks. 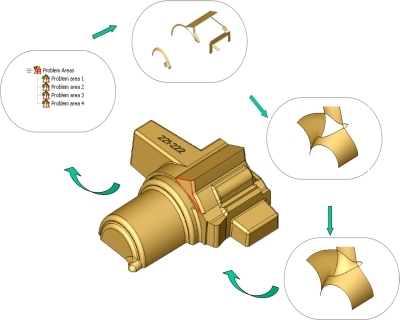 Automatic repair and healing ensures that foreign geometries meet the criteria set by SolidWorks to form valid solids. This repair is always performed within the model tolerance while maintaining original model integrity and preventing model deformation. 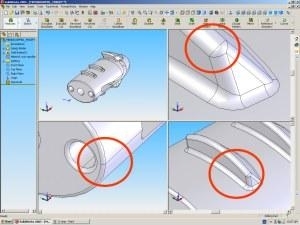 FormatWorks solves frustrating data incompatibility problems occurring furing the import of 3D models into SolidWorks. It seamlessly imports native data formats (CATIA V4, CATIA V5, P/E, etc.) and performs necessary repairs to form a valid model in SolidWorks. The automatic repair includes identification and repair of over 60 typical data translation errors. FormatWorks repairs both geometry and topology using specialized sewing algorithms. Entities preventing the model to form a watertight solid are automatically detected. The automatic repairs are controlled and always performed within the original model tolerance, which prevents model deformation. Manual repair has never been simpler. If necessary, FormatWorks will automatically provide you with the workflow to fix all problems originating in the CAD model. Defective entities are grouped in a project tree as a separate documents. All manual repair operations are intuitive and easy to use since they are completely integrated into SolidWorks. As a result, the user operates only on faulty parts and their neighbours instead of manipulating on the whole model or complex assembly. FormatWorks provides proprietary functions to resolve geometric and topological problems that prevent you from forming a valid solid or surface model in SolidWorks. These functions are developed specifically to maintain the intent and quality of the automotive design.